Quite by accident yesterday afternoon I bumped into one of the honey men. 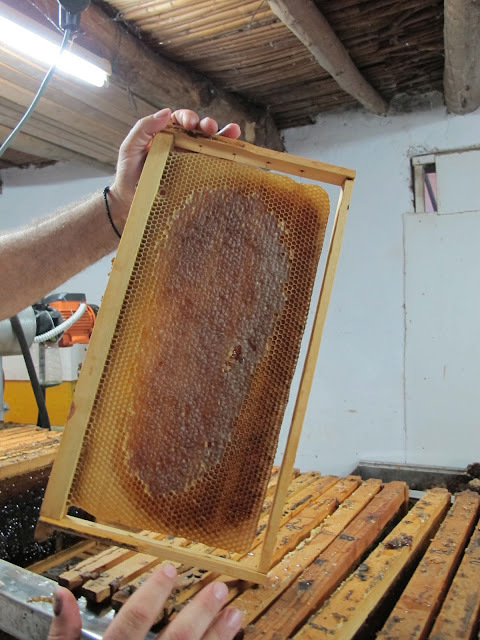 He was busy extracting honey from the honeycombs that had been collected the previous day and invited us in to take a look at the process. We walked down a very sweat little ally way which had i suppose once been a road, it was now used as storage and was complete with its own bath tub! Some of the local bees had turned up attracted by the overwhelming smell of honey. The where hanging out on some of the old hives which where being stored. In years gone by it was somewhat more time consuming than it is today. Today with the aid or modern machinery not only is the process faster, it is more effective and efficient with much less wastage of precious honey. The honeycombs are placed into a machine that vibrates so fast you think it might walk out the door and down the street. The vibrations are caused by two rows of teeth which skim the tops of the honeycombs off so that the next machine can spin the honey out. The first machine spits the now open honeycombs out and stacks them on a rack where a metal tray collects any honey that might seep out while the honeycombs wait for their turn in the next machine. The scrapings will be cleaned and taken to another processing machine, which will turn them into a film to help the bees make the next hive. The second machine is quite clever, it is a large metal barrel with slots on the inside into which you load the honeycombs. The honeycombs are first spun in one direction and then spun in the opposite direction, the spin time for each direction is around 12 minutes. As the combs spin the G force the machine creates forces the honey out of the combs and on to the sidewalls of the machine, eventually the honey collects at the bottom of the machine where it is poured out into a bucket. The bucket of honey is taken over to the final barrel where it will be stored, but first it must pass through a double layer filtration which will remove all the small particles of wax which may have been accidently knocked into the honey. The honey is then stored in huge tanks of 520 kgs until it is sold.